Titan Poker Bonuses - $500 Exclusive Offer. Titan Poker is currently one of top 3 largest online poker rooms in the world, and the largest poker room on iPoker Network. Sporting massive player volume in both cash games and poker tournaments, Titan Poker guaranteed over $16,000,000 in tournament prizes every month. Play with up to 30,000 online poker enthusiasts at peak hours. Players will find a lots of advantages with Titan Poker, such as fast and convenient software, great promotions and satellites to main EPT/WPT/WSOP events, special events, and excellent 24/7 customer support in multiple languages (English, French, Italian, German, Spanish, Swedish, Portuguese, Danish, Russian, Polish, Dutch, Norwegian, Finnish and Romanian). Because of the massive traffic and great game variety, any poker player is sure to find a table that suits their needs. Download version of Titan Poker software offers very easy-to-use interface, realistic graphics, great functionality, and fast game play. What could be more fun than winning a hundred dollars in a fast-paced, sit 'n' go tournament? Winning $100,000 or more at that same tournament! Titan Poker is proud to offer its players an exclusive jackpot tournament series, where they can take home cash prizes of tens of thousands of US dollars. Players will find all variations of Texas Hold'em, Omaha, Omaha Hi/Lo and 7-Card Stud. The games vary between Limit, No-Limit, Pot-Limit and full, short-handed and heads-up tables are also available. Due to the size of the room and geographical diversity of Titan Poker (most players are from Europe), action can be found in almost any game. Deposit and withdrawal options: Credit/debit cards, Moneybookers, Click2Pay, ClickandBuy, Bank Wire, PaySafeCard, NETeller, UKash, EcoCard, INSTADEBIT, myCitadel, UseMyBank, WebMoney, and Entropay. Note: Titan Poker does not accept U.S. players. 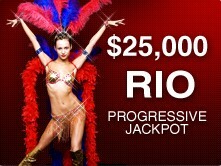 The Rio Jackpot starts out initially at $25,000 and increases by $10,000 each week until some skillful poker player manages to win 6 of the tournaments in a row. The Maui Jackpot starts at $15,000 and also increases progressively week by week. That‘s an incredible deal for a $5 + $1 sit ‘n‘ go tournament entry. Copyright � Casino-Poker-Rules.com 2002 - 2011.